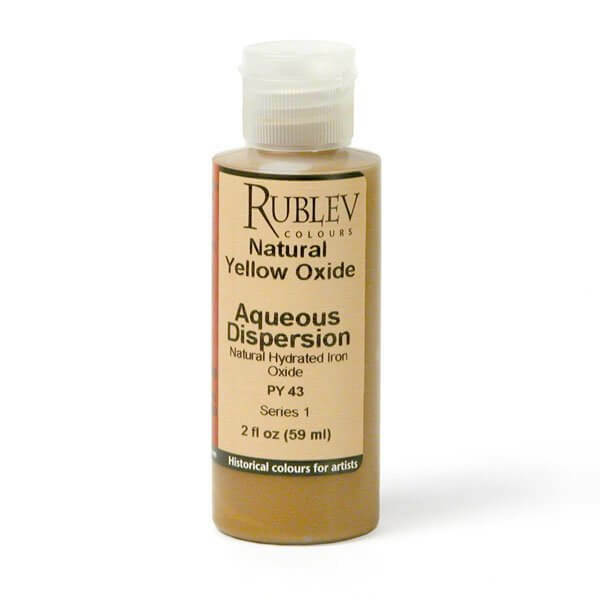 Details Rublev Colours Natural Yellow Oxide is from ocher deposits in the French quarries of Gargas and Rustrel nestled in a 12 mile long enclave in the heart of the Luberon Massif, the ocher country. It is a pigment of outstanding chemical stability and weather resistance. It is has moderate tinting strength, but is more opaque than yellow or gold ocher and has good covering power. Natural yellow oxide absorbs a moderately high amount of oil. The oil absorption ratio is 30–35 parts by weight of raw linseed oil to 100 parts by weight of pigment. If the measurement were grams, the pigment would require 30–35 grams of raw linseed oil to grind 100 grams of pigment to form a stiff paste. It is average to slow as an oil paint, but forms a tough, flexible film.